Shopventory is a cloud-based, real-time inventory management solution which can be integrated with a range of sales systems, including Square, Clover and PayPal Here point of sale (POS) systems, Shopify and WooCommerce for eCommerce, and QuickBooks Online. The platform offers a range of features including customizable alerts, barcode scanning, purchase orders, vendor management tools, reporting, and more. 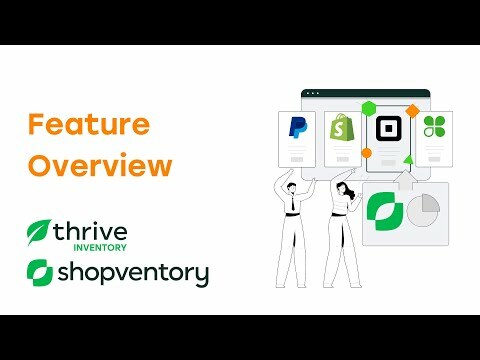 With Shopventory, users can create bundles from their existing inventory, entering and combining ingredients, managing partial quantities of as little as 0.001, and tracking all components alongside finished products. Alternate versions of each bundle can also be created to reflect differences in discounts, commissions, wholesale, peak hours, and other variables. Custom condition-based alerts can be defined to notify users automatically via email when stock levels are low. Alerts are also displayed on the dashboard when users log in to the platform. Shopventory’s vendor management tools include tags, which allow users to add labels to vendor profiles for easy identification of local vendors, those who offers shipping discounts, or for organizing vendors based on what they sell. Users can also assign items and their variants to individual vendors, and add notes to vendor profiles to keep track of important information. A range of reports can be generated in Shopventory, allowing users to track discounts, view full inventory valuations and detailed inventory histories, forecast inventory with predictive analytics, and track how inventory has changed over time. I needed something to help me track my inventory better that also integrated with my Square POS and Shopventory did the trick. It was kind of difficult to set up but the customer support was amazing and they helped me every step of the way. I probably took at least 2+ hours of their time just to help me set up a free trial account. The main reason I signed up for it was to get functionality that wasn't present in square such as setting COGS. Overall I am happy but hope to see some feature improvements in the future. A few drawbacks which make Shopventory difficult to use: No mobile app. This is a pretty painful pill to swallow to be honest. As a small business owner, often times I can only go shopping for ingredients when I have some spare time. Having the ability to check stock levels in real on my phone while i'm shopping would be a huge win. Currently, I try to login to their website on my phone but it isn't even mobile friendly which can be quite frustrating at times. After speaking with support it's also clear this isn't even on the horizon. Upsell quickbooks integration: Not a huge fan of paid SaaS products that lock out features for an additional fee. Quickbooks integration will cost you an extra, which DOUBLES the price of the product. If it's already been developed, why not just include it into the subscription? There's nothing I hate more than feeling like I'm being nickel and dimed. Overall I will continue to use this product as I have already set it up, but it's likely I will look for something in the future that has a mobile app as that functionality is just too important for me at the moment. In a retail situation, the inventory is what the business revolves around. This program is the best and easiest to use. I have tried a few. Their Support Team is the best. They go out of their way to help you solve a problem is it can be solved. However, users do make not smart moves sometimes. Some of these cannot be recovered from. I had a problem with SKU's last week, their tech support went in and helped me reset all my SKU's to something that was valid. No one stops until a problem is solved.The software is easy to use. A lot of features are being upgraded on a regular basis. Seems there is a way to do whatever you want to accomplish. If it is a feature that would benefit a many of their clients, they upgrade as soon as they can. The software is easy to use. A lot of features are being upgraded on a regular basis. Seems there is a way to do whatever you want to accomplish. If it is a feature that would benefit a many of their clients, they upgrade as soon as they can. Not much really. Every so often, I find something I would like that it doesn't have. However with the help of their Top Notch Support Team, we can usually find a way around to get what I need. You are also dealing with someone in the United States. No language barrier. Provides all the inventory management features you wished that Square provided (like a followable paper trail). Makes putting together transfers and orders a breeze. Great, quick customer service team when you have an issue. Constantly improving the system as well as adding features. Great way to tie together your WooCommerce / WordPress store with a physical location. Have been working on mobile apps like an inventory scanner app for smartphones. The pricing tiers are the main issue. Once you go above 3 integrations (locations, so for example, 2 stores and a website) you have to go to their 10 location tier, which is over double the price. You can't add a pop-up or anything like that. User access controls have been improved greatly, but are still less customizable than I would wish. Because the development team is small, they sometimes introduce bugs into the system that will mess up your inventory, but the customer service team is great and will fix it for you pronto. My only qualms are that certain improvements don't have quite the customizability that I would hope for, but I imagine that these additional improvement are simply still in the he works. The other con is that Shopventory isn't compatible with Squarespace yet! So I'm anxiously awaiting for that update to release. There is a few basic things missing, like the possibility to write notes on a partially received PO, or if you make a mistake. In fact you can't write notes anywhere which is quite annoying. It works in modules and I think the price it's too high for what they are offering for professional and Elite packages. 30-day full-feature free trial, no credit card required. Starter: $49/month (billed monthly) or $39/month (billed annually). Standard: $99/month (billed monthly) or $79/month (billed annually). Professional: $249/month (billed monthly) or $199/month (billed annually). Elite: $499/month (billed monthly) or $399/month (billed annually). Users can create an unlimited number of condition-based alerts for different products, locations, and stock levels, with automatic email and dashboard notifications for low inventory items. Native apps for Android and iOS devices allow users to scan item barcodes for receiving shipments and reconciling stock, directly through their mobile device’s camera. With Shopventory’s built-in reports, users can view detailed inventory histories, identify slow-moving inventory, and track discounts and profitability. Vendors can be tagged based on their location, any discounts offered, the products their provide, and any other criteria, and users can add notes to vendor records to track any additional information. Products can be uploaded in bulk through direct integration with Google Sheets, and users can create and update inventory items, variants, and quantities. Below are some frequently asked questions for Shopventory. Q. What type of pricing plans does Shopventory offer? Q. Who are the typical users of Shopventory? Q. What languages does Shopventory support? Q. Does Shopventory support mobile devices? Q. Does Shopventory offer an API? No, Shopventory does not have an API available. Q. What other apps does Shopventory integrate with? Q. What level of support does Shopventory offer?